Hell, yeah? Hellish, more like. Despite its lead’s best efforts, this disastrous deboot is a gore-soaked bore. It probably made sense on paper. 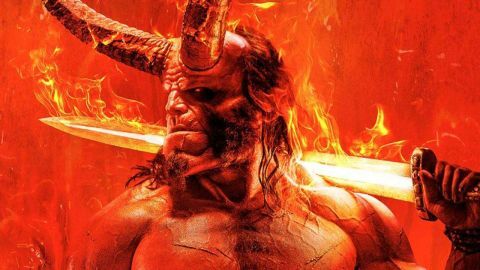 For all their warm critical reception and cult popularity, Guillermo del Toro’s two Hellboy films hardly set the box office ablaze. When talks about a potential third fell through and Dark Horse opted to go down the gritty reboot route, it seemed to pick the right team for the job. Enter Neil Marshall, well accustomed to mixing sweary laughs and gore in Dog Soldiers – not to mention helming CG-assisted scraps during his time on Game of Thrones. And welcome David Harbour as the big guy, fresh from the Duffer brothers’ nostalgia-soaked Netflix smash Stranger Things. Alas, this is one duffer that won’t bring back fond memories. Before we meet Nu-Hellboy, we’re introduced to Milla Jovovich’s Nimue, Blood Queen, soon to be reduced to kit form thanks to King Arthur and Excalibur. Fast-forward 15 centuries or so, and she’s been reassembled by Stephen Graham-voiced, profanity-spitting hench-boar Gruagach; alongside Sasha Lane’s kooky psychic Alice Monaghan and Daniel Dae Kim's shapeshifting officer Ben Daimio, it’s Hellboy’s job to stop her. What follows is disjointed and messy in every sense – the splashy CG blood and guts detracting from some occasionally decent practical effects. It’s hard to blame Harbour, who does his best with what little he’s given, straining to recapture the gruff charm he showed as Jim Hopper with a character who spends most of the film frowning or moaning. Still, he’s got big screen presence, having bulked up for the role – which is in stark contrast to Andrew Cosby’s decidedly malnourished script. Hellboy is supposed to be fighting demons inside and out, but his conflict is reduced to nothing more than a few short mutterings of concern about destroying his fellow monsters and a bit of bickering with his adopted dad (Ian McShane, half-asleep). That’s quickly and inexplicably resolved thanks to an out-of-nowhere encounter with scuttling hag Baba Yaga – a creepy set-piece standout, not that there’s much competition. Otherwise, Benjamin Wallfisch’s deafening score bludgeons the tension and excitement out of every murky, choppily edited action scene, while the laugh-lines land with a deadening thud: its wit-free wisecracks make Deadpool 2 look like Airplane!, with Graham’s abrasive sidekick the worst offender. It’s one thing to make a film for teenage boys, but at times it feels like Hellboy was made by them. Harbour and Lane emerge with dignity bruised but just about intact. And Marshall? It feels like quite the descent since, well, The Descent, but the disjointed end product positively reeks of studio interference – as does a sequel-baiting final sting, which seems optimistic in the extreme. Only one person comes out of this unholy mess with reputation enhanced: if there must be a follow-up, then bring back Del Toro. Find out what other upcoming movies you need to watch out for this year with our 2019 film breakdown.